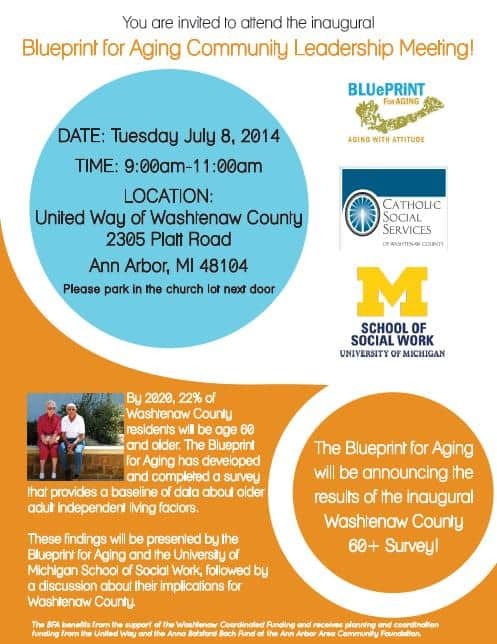 The Blueprint for Aging is thrilled to announce that we have reached our goal of collecting 600 surveys as part of the Washtenaw County 60+ Survey! In conjunction with the U of M School of Social Work, we are in the process of analyzing the data and will be presenting the results at our inaugural Community Leadership Meeting. The Blueprint for Aging is a multi-agency collaboration that works to improve services, care and quality of life for older adults in Washtenaw County. For more information, please visit www.blueprintforaging.org. Click on the flyer below for complete details. We hope to see you there!